So, this topic came into my mind when I was thinking about the BC Hwy 1 (TCH 1). 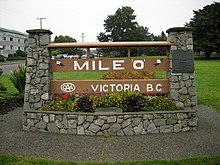 So why couldn't they reroute the TCH 1 onto BC Hwy 10 Bypassing to BC Hwy 99. This is because the TCH continues on Vancouver Island from the Victoria Ferry Terminal. So is it really good to extend the TCH going to North Vancouver and West Vancouver all the way up to Horseshoe Bay and than taking a ferry down south to Victoria when they could've token the 99 to the Tsawwasseen Ferry Terminal. Hwy 1 has become more of a "tour" road. It wasn't even re-routed when the Coke opened. If they wanted Hwy 1 to be the fastest way from Alberta to Victoria, they'd re-route it along the Coke, and then through Langley towards Delta. But it's more heritage at this point. TCH 1 is interesting through the Lower Mainland because it's the main freeway through Metro Vancouver, but then is not the most direct route to Victoria. The routing through Vancouver makes sense, and a compromise could be rerouting the ferry to Duke Point, which would bypass downtown Naniamo. Saying that, I recall seeing a proposal for BC Ferries shutting down the Naniamo-Horseshoe Bay ferry, it was vetoed by the MoT, but if that were to happen then it would make sense to reroute TCH 1 to Tsawwasseen. Why not just end it at Horseshoe Bay? At that point the TCH has already done it's job at crossing the continent. We Canadians are so pedantic. Because then you'd have to move this. Come to think of it, why isn't there a true freeway connection between BC 99 and TCH 1? Sure, Vancouver hates freeways, but you'd think one would have been made out in the suburbs (perhaps near the BC 15 corridor). I've been wondering something similar with TCH 16. I can understand TCH 1 to Victoria, but TCH 16 to Masset doesn't make sense to me (it also makes clinching TCH 16 a LOT harder). This is something I've wondered about for a long time. I've always thought that there needs to be a connection from BC 99 to TCH 1 along the BC 15 corridor. It is really annoying that you can't go from I-5 to TCH 1 and remain on a freeway. The MOT did construct the SFPR a couple years ago, which serves the same purpose. Its not a full freeway, but it only has a few signals, and in my experience, they are well timed, and the trip between Hwy 1 and Hwy 99 is fairly quick. As for a full-scale freeway some time in the future, it's hard to say. The MOT is very pro-freeway, as is Greater Vancouver as a whole. But as the City of Vancouver grows, so does its influence on the suburbs. The Skytrain is slowly reaching across the lower mainland, and development patterns increasingly favor public transit and walking over driving. All of this aside, however, there simply isn't enough demand for an east-west freeway. Most of the traffic from the east is going to Vancouver or Seattle, neither of which use Hwy 99. Travellers entering at the Peace Arch (I-5) crossing are generally going towards Vancouver; those heading east towards Hope would have used another border crossing (Abbotsford/Sumas crossing, most likely). I've always thought that there needs to be a connection from BC 99 to TCH 1 along the BC 15 corridor. It is really annoying that you can't go from I-5 to TCH 1 and remain on a freeway. How many people are doing this, though? It'd be nice, sure, but I don't know how heavily trafficked the route would be (i.e. I don't think the cost/benefit analysis would favor such a road). At least you are not shallow. The problem with Vancouver is that there are no major destinations to the north or west, resulting in Vancouver being the end of the road. There is Whistler to the north, but trade to northern BC would go east and then north at Hope via TCH 1 and BC 97. BC is currently expanding BC 97 between Cache Creek and Prince George - I wonder if BC 99 were to be expanded between Whistler and Cache Creek (major $$$) if the need for a better north-south Vancouver bypass would be needed. The SWRR is a defacto expressway connecting Highways 1 & 99, but a case could be made for a southern east-west freeway. With YVR, Tsawwassen Ferry Terminal, and Roberts Bank Superport in the west; and the growing valley suburbs of Surrey, Langley, and Abbotsford (including YXX) in the east as well as the major connection to the rest of BC and Canada in the east. The BC 10 corridor could serve as a partial ring road that connects Hwys 7, 1, and 99. I would have thought it would have been anyone from Vancouver's southern suburbs heading to anywhere else in Canada, especially the destinations to the east on TCH 1. I imagine the only reason there isn't heavy demand for such a connection to/from the US as well is because of the border wait times at the Peace Arch. Most of the arterial roads in Surrey and Langley are of very high quality, often expressways with 70-90 km/h limits, with only a few signals. You could build a freeway, but it wouldn't necessarily speed up the trip. In fact, it may induce demand that is otherwise spread out amongst many different roads. Most of the cars going from the Surrey and Langley areas towards Hwy 1 East are holiday traffic. Most people work in the Greater Vancouver area (so if you live in Langley, for example, you either work in Langley, or somewhere north or west of there). Because Victoria is the capital of BC. The TCH system doesn't directly serve Nova Scotia's provincial capital, nor Ontario's.